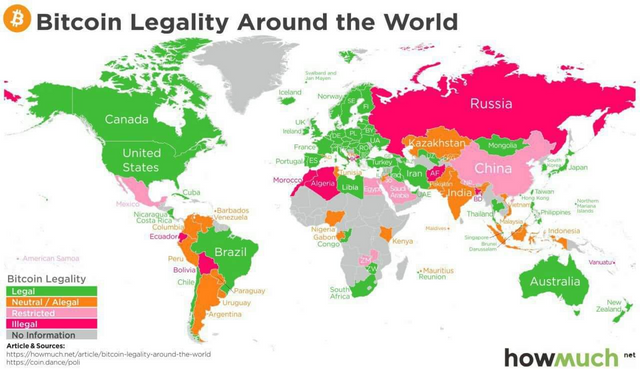 Where Does Your Country Stand On The Legality And Regulation Of Crypto?steemCreated with Sketch. I can't see my country in the graph! Happy to see this much green, i hope it will replace all the illegal area too in the coming future. You can't see mine because it's so tiny but yeah we pretty much support Crypto. Your UA account score is currently 4.601 which ranks you at #1705 across all Steem accounts. In our last Algorithmic Curation Round, consisting of 253 contributions, your post is ranked at #209. Try to improve on your writing: if you write interesting content, chances are more people will appreciate your content!